Sure, summers in Georgia are hot but that doesn’t mean summer weddings aren’t worth considering. While the heat & humidity may be a factor, summer weddings have plenty of good things going for them, they may just require a little extra planning. All pictures in this blog post are from summer weddings held at Pepper Sprout Barn. The upside of planning a summer wedding. For many venues in Georgia and the Southeast, July and August are considered off-peak months. That’s great news for you because that means discounted venue costs. Be sure to ask about specific seasonal discounts during a tour. In summer, all color pallets are in season! Pick your favorite colors—neutrals, brights or pastels, they all coordinate with a season in bloom. Speaking of bloom, most flowers are in season, so you have the most options. Another bonus to in-season flowers are reduced costs. When you can by flowers locally or from US growers, you save money because the flowers are not imported. Another way summer weddings can save money, smaller guest counts. Often guest counts are a little lower because it’s the season of vacations. With some vacays planned out months, if not almost a year in advance, some guests won’t be able to attend. On the flip side, if you have a lot of out-of-town guests and you give them plenty of notice about your wedding date, then chances are they can come, using their summer vacation days to attend your big day. Summer weddings help your out-of-town guests with travel plans. Most people can take vacation time in the summer so it’s easier to travel. Fall and winter, with so many holidays packed it, people have to choose their trips wisely and can’t always accommodate a wedding in the schedule. With summer weddings, guests can combine the wedding into another trip. Summer = sunshine so that means more daylight for your day. More daylight means more hours for pictures and partying. Your day will feel less rushed and you’ll have plenty of time for photos, cocktails and dancing! When searching for the perfect venue, keep these thoughts in mind! If you want your guests to stick around and remember your day fondly, we suggest you find a venue that has AC & shade options for your guests. Trust us, they’ll love you for it! Summers in the Southeast are synonymous with popup rain storms. Ask your venue about their rain plan, if they don’t have one, that might be a red flag because summer storms are unpredictable and it’s best to avoid last minute tent costs or soaking wet guests. Rain plans are a must in our world. Read more about how we handle rain in our recent blog post. Another unwelcome summer factor…mosquitos! Ask you venue if they treat for mosquitos—we do and have for years, keeping those pesky critters at bay. Some of our summer couples opt for an indoor ceremony to avoid the heat altogether and just go outside for pictures. If that sounds like the perfect plan for you, ask your venue about the ways they do indoor ceremonies. Though temps can be high, many couples still want to say their “I do’s” outside, that’s possible if you plan ahead! Often your attendants and officiant are standing outside the longest. For summer weddings, we recommend that you consider the guys’ comfort—perhaps opt-out of a jacket for the ceremony. You don’t want anyone fainting and stealing the spotlight from you! Your guests are also outside for up to 45 minutes before you walk down the aisle. Be sure to plan ahead and take care of your guests if you are having an outdoor ceremony. Many of our couples opt to provide fans, water, sunscreen and bug spray to help them stay comfortable and upright! Advance warning is appreciated. Tell your guests the wedding will be outside—that way they can plan ahead too and pick an outfit best suited for the affair. Comfortable shoes, low heels are best for outdoor summer ceremonies but having a handy layer helps if the AC is blasting inside. If you’ve lived in the Southeast long enough, you know it can be steamy outside and freezing inside. We like our AC in the South! Rain kept us guessing for this June wedding. 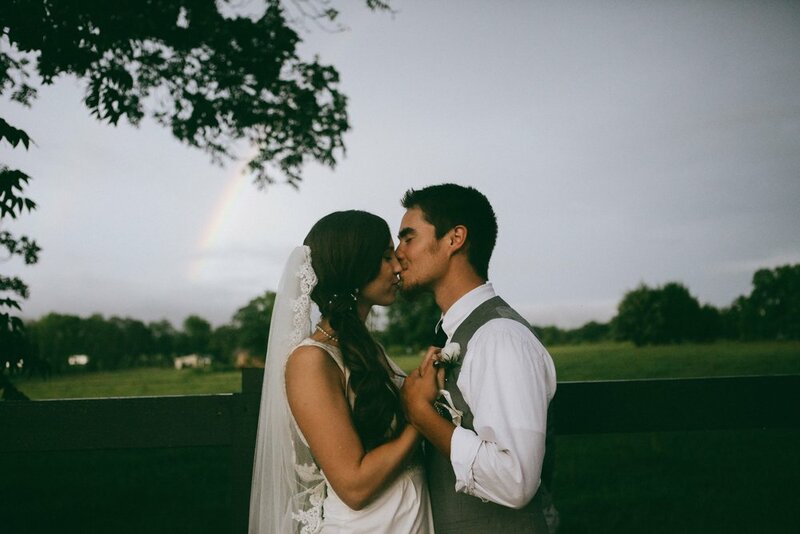 It showed up post-ceremony and gave us a gorgeous rainbow! Summer weddings have a lot on the pro side but there are a few things that don't work so well when it is 90 degrees out with 90% humidity. Outdoor cocktail hours are not recommended. Flies, melting ice and potentially souring food are not pleasant experiences for your guests. After you are hitched, they will all be anxious to get inside. Let them cool off and enjoy the apps and cocktails in the refreshing AC building. It’s not often ceremonies last more than 20 minutes any more but especially for summer weddings, we suggest avoiding long ceremonies. If you are planning a ceremony that includes communion, extra readings, songs, knot tying or tree planting ceremony, talk to your officiant about ways to condense the elements or consider hosting your ceremony at a church and coming to your venue for cocktail hour & reception. Take it from a girl that knows, curly hair does not have it’s best days in the summer heat! Frizz and unruly curls are our reality so if you or your bridesmaids have natural curls, an up-do may be the way to go! Be sure to do a test run for your wedding day style—curly hair has a mind of it’s own and some stylists are more versed on the challenges of curly hair than others. Three more tips to consider! When it comes to your timeline—think ahead. If you want a sparkler exit, you are going to need a later ceremony because it doesn’t get dark til 9pm-9:30. Most receptions last about 4 hours and a sparkler send off at 10pm will ensure perfect pictures but remember you need guests to stick around until then so start things a little later. Want perfect sunset pictures? A definite possibility in the summer but talk to your photographer about their recommended times for ceremony and portraits. With all that in mind, guests do tend to stay longer for summer weddings. Summer weekends are relaxed and with the sun setting later, the days feel longer. If you are doing dinner early, you might want to consider a late night snack after the caterer leaves. We’ve seen popcorn bars, sandwich displays and coffee bars. All are great options to keep hunger at bay and your guests on the dance floor. Encourage your guests to make a weekend out of it! Many of our couples will give their guests an option to rent a house or cabin on a nearby lake, turning the wedding into a weekend experience. Lake life lends itself to relaxed days, boat rides, and summer nights on the porch with a cold beer. So many memories are made in the hours or day preparing for the big day. As you may be able to tell, Summer weddings can be a great idea with a little extra planning. If you need more tips on hosting your own summer wedding, comment below and we’d be happy to share our thoughts. Have your heart set on another season, this blog post is the last in our series and we’ve covered all the seasons. We share our tips and tricks for Fall weddings, Winter Weddings and Spring Weddings on the blog too. Feel free to bounce over and see why we are fans of all the seasons!